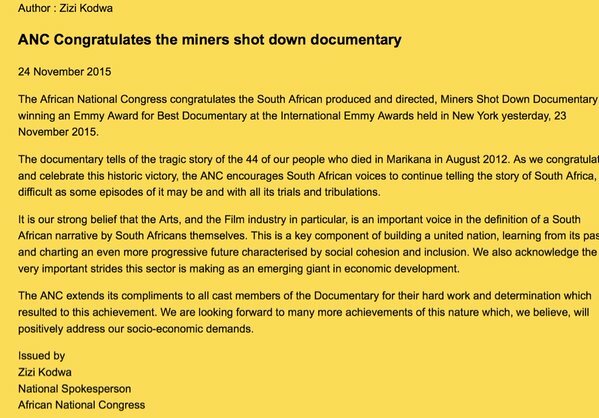 South African documentary, "Miners Shot Down" scooped an Emmy award for best documentary at this year's ceremony held on Monday, 23rd November. The documentary details the story of the unfortunate 2012 Marikana massacre which saw more than 34 miners killed and others injured when police opened fire on striking miners workers in Marikana. 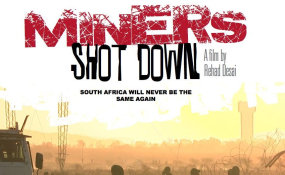 Since its release, Miners Shot Down has been screened hundreds of times internationally across various countries and won over 20 awards. Despite scooping an internationally acclaimed accolade and the ANC sending well wishes to cast members, the SABC & e.TV have refused to broadcast the documentary. Miners Shot Down has won the International Emmy Award 2015 for the Best Documentary. It has been screened 100's of times internationally and locally and won over 20 awards, yet the SABC and e.TV refuse to screen it. South African's deserve to know the truth and now the film is available for all to watch online - we can no longer wait for our local broadcasters. Please watch and share, and help us to continue the struggle for Justice.